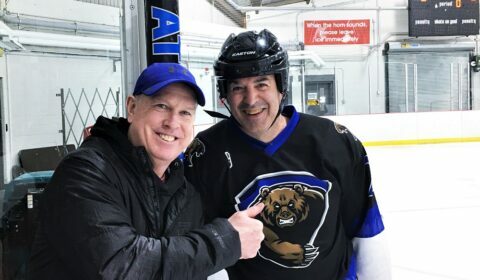 GRAVENHURST — Three wins and a loss. That’s the Gravenhurst Old Indians’ record at the Amazing Grays hockey tournament this past weekend. And while the victories were heartening, it’s the latter game against the Innisfil Crown Royals that they’ll remember the most. A 3-1 loss in Sunday morning’s final, to a team they beat 6-2 less than 24 hours before, was disheartening. Coach and GM Dave Christensen said the Indians deserved the wins but that the best team won in the championship final game. The good times: Coach/GM Dave Christensen gives Tim Grimes the thumbs up on Saturday morning. Old Indians Ian MacDonald, left, and Tim Grimes come off the ice smiling following their second win, Saturday morning, a 6-2 thumping of the Royals. The Crown Royals were two goals better in Sunday morning’s final, to take the men’s division. There was plenty of action in the two 15-minute, stop-time periods with the Royals and Indians scoring eight goals in their first meeting.